Back in the days, I would have gotten something totally useless for a baby shower. Now with so many friends with new babies, I am becoming savvier with gifts. I have not tried this before but I would totally get/make a nappy cake if a gal pal is expecting now. 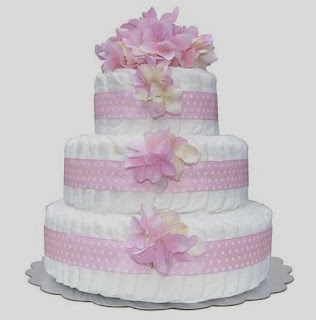 (See how to make a nappy cake) Of course, there’s no actual ‘cake’ involved – nappies make up the shape of a traditional cake in tiers, typically between one and three. A nappy cake is a creative gift that is also rather practical. With diapers making up the cake, it is also rather cute to add other baby essentials for the cake filling. Some ideas to fill the cake can include baby clothing or blankets for as icing. One can finish the cake, one can choose a pair of baby shoes or a small toy as cake topper. The end result is a spectacular looking cake shaped gift, full of practical surprises that the expectant mommy is sure to find useful. A nappy cake, while looking intricate, isn't actually too difficult to make. One can put one together in an afternoon or an evening. Follow these instructions for how to make a nappy cake and you’ll have a fantastic gift that is sure to delight everyone at a baby shower. The basic cake is made up of nappies arranged in a circular style. Consider skipping newborn nappies and going a size up, in case the mum is already stocked up with the first size. In the center of the nappy circle, add fillings. Baby essentials such as wipes and toiletries are a good idea, although it is also nice to add little treats for the mommy-to-be, such as a luxurious body lotion or stretch-mark cream. You’ll also need elastic bands and a cake board. To ice the cake, blankets or a baby towel offer a smooth, neat finish. You can also use items of baby clothes such as baby gowns and bodysuits. Little booties and socks can be added to the basic cake for an extra special touch, and baby shoes or a soft toy make a great cake topper. 1 – Roll the nappies individually and secure with elastic bands. 2 – Arrange the nappies in a circle on the cake board with your ‘filling’ in the middle of the nappy circle. Secure with a large elastic band, string or ribbon. 3 – Fold a blanket, baby towel, muslin or your choice of baby clothes and wrap around the outside of the nappy circle. Secure with a wide ribbon. 4 – Repeat steps to make additional tiers. 5 – Build the nappy cake, adding any little surprise items such as booties, socks or small toys. 6 – Add a pair of baby shoes or small soft toy to the top of the cake. 7 – Wrap with cellophane and secure at the top with a ribbon. You can get cellophane by the meter from a florist shop, gift stores or online. Once your nappy cake is complete, all you need to do is wait for the baby shower to come around for the perfect opportunity to hand over the impressive gift to your delighted friend! What do you typically buy for a baby shower?? haha.. such a cute idea!